An acrid laid devolves to stone. The sorceress is now full-grown. A sickle's strike one mighty felled. By burning letters, evil quelled. Night light helps release the True. Survive the fight, regain the prize. Beyond the height a fine surprise. Richard and Baal are in a stalemate in their drive to get to the pod first, which forces Orkan to make the difficult choice of leaving the pod with Baal and to retrieve it later. With that decision, Richard, Melek, and Orkan retreat from Baal and the pod, eventually leaving the evil spider with his new prize. As they put more and more of a distance between themselves and Baal, Richard begins to notice that the ground beneath him grows steeper and steeper. Eventually, the sharply climing hill falls away just as sharply; the companions move down the slope to end up in a sandy gulch, just below a valley where a city is located. Thinking that somebody in the city might help them rescue the pod, the companions head into the city, which feels oddly silent and still. Once inside the city, the trio sees just why. Everything in the city is made of stone, and not just the buildings and streets. All creatures and people they encounter in the streets are all made of stone, their faces frozen in horror. As they move deeper and deeper into the city, Melek comments that the city they are in must be Petropolis, the stronghold of Mirra, a magician who can turn people into stone with just a single nick of her sickle. The three travelers eventually find themselves inside an enormous town square. There, they find themselves in the midst of a mighty battle now frozen timelessly in stone. 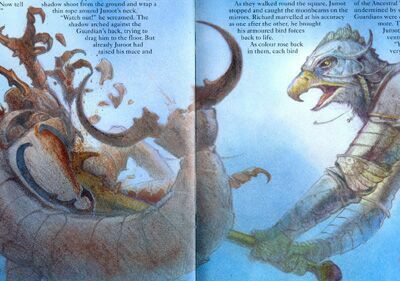 All around the square, they saw enormous birds (or birdmen) fighting off an army of giant earwigs. As Richard looks around, he notices one magistic bird standing above the rest, brandishing a deadly-looking spiked mace, ready to strike down a defiant earwig at his feet. Richard asks who this magnificent bird is, and Melek answers that it must be Juroot, the Guardian of Birds and the Keeper of Justice. Richard states that they must try to free Juroot, but Melek adds that only Mirra is the only one who can reverse the spell; she uses a pair of mirrors and the light of the moons in a manner that only she knows in order to accomplish this task. The three decide to consult the next riddle in the Book of Prophecies, but they are puzzled by its words, particularly the mentioning of the "burning letters". Just then, Orkan utters something and everyone looks up to see a figure walking across the town square towards them. The figure, carrying a sickle and a set of mirrors, is most certainly Mirra, and she eyes the strangers in her city with a cold glare. Richard realizes that he must distract her...and hears Golan's voice inside his head, telling him to give Mirra the badge that belonged to the Mighty Muldoon. Taking up Golan's instructions, Richard approaches Mirra and states that he and his companions have travelled far to find her, and that they are here to give her a reward for her loyalty to the Evil One. Mirra seems glad with this honor and eagerly accepts Muldoon's badge, pinning it to her robes. She then looks at the trio and says that she needs to give them something in return...and decides to turn them into stone as a reward. Richard and his friends look around for a way of escape, but there is none. However, when all seems lost, Muldoon's badge suddenly begins to glow a deep red. Then, without warning, the mysterious letters encraged on the badge's rim spread out across like liquid metal, spreading across Mirra's breast in flame. Mirra screams and drops her sickle and mirrors, trying to put out the fires. Richard moves quickly and snatches up the sickle. He tries bearing it down on Mirra, but the magician grabs his hand and stares at him with pure hatred. But then the flames reach her face, causing Mirra to let go of Richard's hand. Richard wastes no time and sinks the sickle's blade into Mirra's flesh. When he pulls the blade out, Mirra is a statue frozen in agony, but Muldoon's badge continues to burn. The flames completely engulf Mirra in a cloud of smoke; when the smoke clears, all that's left of Mirra is a pool of black lava, the badge nowhere to be seen. As Richard takes a breather from his encounter, Melek reminds him of Juroot. Richard then suddenly remembers the riddle and points out it could be referring to Mirra's mirrors and the moonlight. He does wonder how they could perform this task, and Orkan steps up to demonstrate. He grabs a mirror, positions it correctly, and soon a beam of moonlight is shining over Juroot. However, the moonlight is the wrong color; Orkan suggests they wait until morning to see if the moons change color in daylight. With the square less threatening with Mirra dead, the trio soon fall asleep. When morning approaches, Richard quickly wakes everyone up; the moons are glowing every available color of the rainbow in the daylight. Orkan and Richard each take a mirror and position them until blue and purple beams are shining on Juroot. Suddenly, two bolts of energy shoot from the mirrors and collide with the frozen Guardian. Within a few moments, color begins returning to Juroot's features. But before Richard can begin celebrating, Orkan yells at him to get out of the way - Juroot's mace was about to fall right on top of them! The trio quickly scatter moments before the Guardian's mace collides with the ground with a loud crack. Juroot glares at Richard, Orkan, and Melek with a deadly look, but then he notices Richard's eyes. He quickly softens up as he recognizes the Chosen One and thanks Richard for freeing him from Mirra's spell. He then steps forward and hands Richard a dagger, saying it would serve him well in his quest. Richard thanks Juroot for the dagger - which, in his hands, looks more like a sword - and proceeds to tell Juroot of his prior adventures. Juroot nods approvingly until Richard says that a Life Force Pod was left with Baal; the Guardian informs Richard that the pod must be recovered or all will be for naught. Mirra's sickle should be enough to overcome the giant spider. Just then, a grey shadow sneaks up behind Juroot and wraps a cord around his neck, pulling him back and trying to drag him to the ground. Richard screams for the Guardian to watch out, but Juroot has already raised his mace, which is sent crashing into his assailant. The attacker was none other than the earwig at Juroot's feet; some of the moonbeams must've touched him when Juroot had been freed. Juroot warns the three that there are more of his kind out there and to be careful. Juroot then states he must free his forces from Mirra's spell. Richard hands him the mirrors, and the four go around the square, using the mirrors and the moonlight to free each and every one of Juroot's bird forces. One by one, as they regain the ability to move, the birds take a step forward and salute their leader. During this process, Juroot explains to the trio about the rise of the Evil One. At first it started small, but then it grew. A few people went missing, and then entire villages. Wells were posioned and farms were burnt down. Guardians were dispatched to find out what unseen force was undermining the fabric of the Ancestral World, but they also disappeared. Juroot had been the third to venture forth and not return. After his explanation, Juroot tells Richard to go reclaim the pod from Baal while he continues with what he needs to do. The trio agree and head out of Petropolis with Juroot saluting with his mace held high. As the three make their way back to Cobweb Wood, Melek complains that the books he's carrying seem to be getting heavier and heavier. 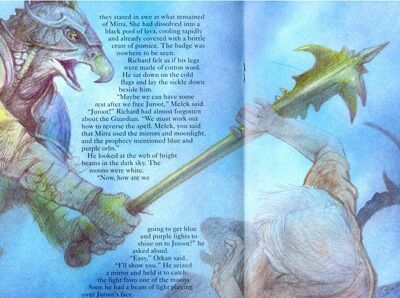 Orkan snaps that there's only one book, but Melek points out he's carrying a book other than the Book of Prophecies. Orkan tells Melek to throw the second book away, but Melek refuses because it might help them defeat the Evil One. Orkan asks to see the book, which Melek pulls out. The book is Morbane's Book of Monsters and Magic, a tome written by one of the Ancestral World's oldest and wisest magicians. The book describes beasts and their magic from all over the Ancestral World, and some of the beasts the trio has already encountered bare resemblence to some of the creatures Morbane wrote about. Richard agrees the book might be helpful, but reminds them that they must first get the pod back. Eventually, the three find themselves in the clearing where Richard had almost been killed by Lotan. Lotan's carcass was still there, but it had been completely picked off by a colony of soldier ants tearing away all available pieces of flesh. Richard is disgusted by looking at Lotan's completely bleached skeleton, and informs his friends that they should head to Baal's larder and wait for him there. Just then, they hear a familiar stomping noise; Baal is already after them. 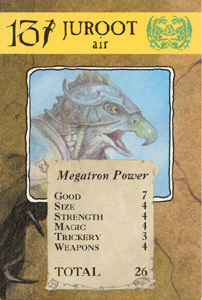 Richard quickly hides in the undergrowth while Orkan and Melek turn to face Baal, who emerges into the clearing. The spider doesn't use its silky web to trap the pair, but instead takes a series of steps to get within arm's reach of them. 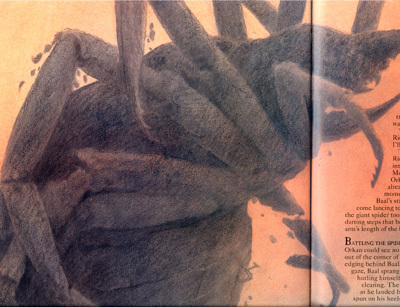 As Baal approaches, Orkan looks behind the giant spider and notices Richard edging his way slowly behind the arachnid. Baal notices Orkan's gaze and abruptly springs into the air, landing right behind Richard. 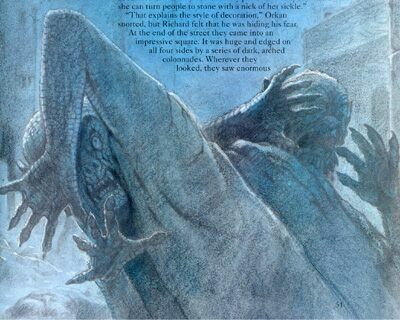 Richard spins around on his heels to face Baal, who is ready to strike with his venemous pincers. Summoning all his strength, Richard throws Mirra's sickle at Baal, landing it directly in Baal's soft underbelly. Richard then rushes to the side of his friends and turns back around to see Baal frozen as a colossal statue, the sickle lodged in his belly. The unbalanced statue begins to wobble and then topples forward, forever burying the sickle beneath Baal's shattered body. Richard, shuddering, asks Melek for the Path Finder so they may find the pod and leave as soon as possible. The golden tip of the Path Finder leads them to another one of Baal's cocoon larders, the possible contents of which make Richard's blood run cold. Suddenly, Orkan sees the pod in one of the cocoons. Richard snatches it from the silken prison and returns it to his bag. With the pod safely secure once more, Richard suggests they head back to the ridge, since the prophecy mentions a "surprise beyond the height". They make their way back to the ridge where it dipped off sharply, and Orkan notices a path they hadn't seen before. Following the path into trees on the steep bank, the three eventually find themselves on a tree-less spit of rock that hovered over a seemingly bottomless abyss. Richard wonders aloud if they could ever get down there, to which Orkan suggests Melek's rope. 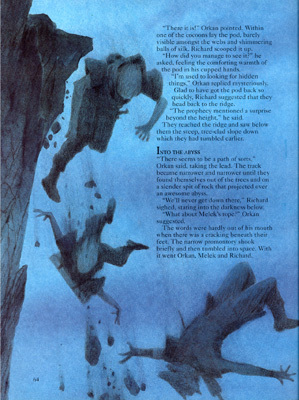 Suddenly, the edge of the cliff beneath their feet cracks and then breaks from the rest of the crack, taking Richard, Orkan, and Melek with it. 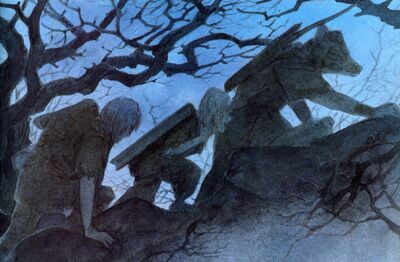 The three begin tumbling into the darkness below. Juroot is the Guardian of Birds and the Keeper of Truth. A birdman with the face of a mighty eagle, Juroot is a stong warrior who wields a mighty mace that can shatter stone with one swing. When the Evil One began corrupting the world, Juroot was the third Guardian sent out to investigate what was going on. He and his men were ambushed at Petropolis by an army of giant earwigs, where a great battle ensued. But the battle was merely an distraction in order for Mirra the Magician to use her magic sickle and turn everyone in the battle into stone. Juroot remained frozen as part of Mirra's collection until Richard the Chosen One freed him using Mirra's mirrors. The Bird Forces are bird creatures who are fiercely loyal to their Guardian and leader, Juroot. 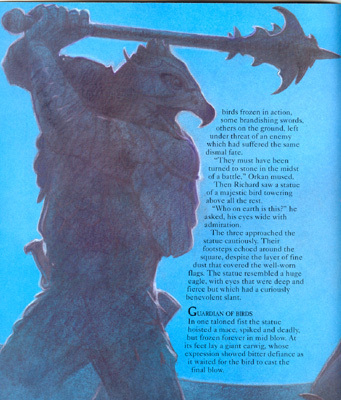 Some of them are birdmen who attack on the ground using traditional weapons such as maces, while others are regular birds that can fly as air units or scouts. 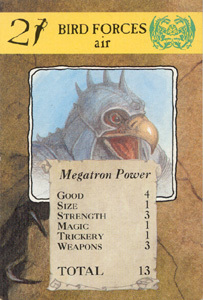 Some birdmen were deployed with Juroot to investigate the strange goings-on of the Ancestral Trail when they ended up in a battle with giant earwigs in Petropolis. Like Juroot, they were frozen in stone by Mirra, but were freed thanks to the Chosen One. Mirra is a magician who lives in the city of Petropolis, which she had claimed as her lair. It's unknown whether Mirra can work magic, but she is skilled at using several ancient relics that have made her famous: a deadly sickle that can turn any living thing to stone with one nick of its blade, and two circular mirrors that can reverse the stone spell with the correct light. It was Mirra who imprisoned the Guardian Juroot, as well as his entire army. "A tall red-haired figure had emerged from one of the dark arches and was sidling noiselessly in their direction. They stared transfixed as Mirra came closer. She wore long dark robes and gold bracelets shaped like serpents. In the strange moonlight, the metal glinted making the snakes seem almost alive on her arms. In one hand she carried a small sickle and in the other, two round mirrors." The fourth volume of The Ancestral Trail marks a couple interesting turning points in the series. For starters, the title creature of the volume, Mirra the Magician, is dispatched of within a couple pages of the story (not to mention the heroes' battle with Baal took barely that much time). This is a moment in the story where the focus is not on the villain but on another aspect of the story, this one being namely the Guardian Juroot; Juroot received more mention in this issue than Mirra and Baal combined. So while there may be a new creature for Richard and friends to battle in each issue, that does not mean those creatures will be the main focus of the issue. This issue also marks an important milestone for Richard in the series: he killed something for the first time, both directly and indirectly. 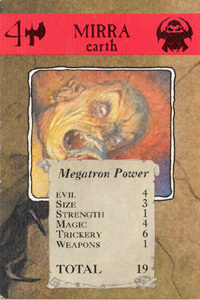 He killed Mirra indirectly when he gave her Muldoon's badge, and he was the one who made the decisive blow against Baal. It's not too much of a stretch to assume that Richard will be killing more often in later issues of the series, especially since Juroot gave him a weapon of his very own. Finally, this issue marks the first time that a Guardian is released from capture. Juroot was held captive by one of the Evil One's servants, so could the other Guardians be imprisoned all over the Ancestral World? If they are, then what other fearsome beasts must Richard face in order to rescue the other Guardians? On one final note, in this volume Melek mentions a second book he carries around with him, Morbane's Book of Monsters and Magic. 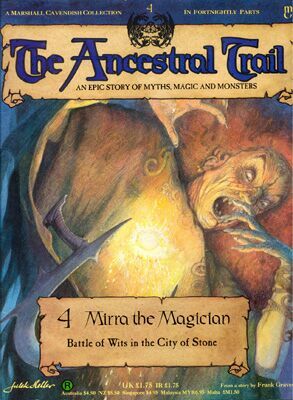 This book is actually a set of extras included with The Ancestral Trail, much like the collectable cards. Each issue of the series would come with two stories relating to the monster of that issue, and it would be up to the reader to guess which story the monster was based upon. Some of the stories included are familiar to most people, such as the story of David and Goliath and the legend of vampires, while others were a bit more obscure, such as the tale of the witch Baba Yaga. The inclusion of the Morbane book in the story isn't really that important, as it is never referred to again. However, it is an interesting tie-in with the story and the series' collectables. "Now I must give you something too. I know, you shall have immortaility - among my collection of statues." "You must go back! If even one pod remains with the evil forces all your efforts will be in vain." 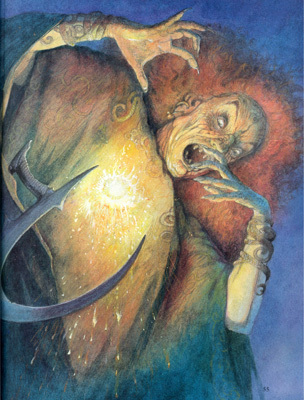 "Morbane was the oldest and wisest of our magicians. He travelled the Ancestral World and wrote about the monsters he encountered. He describes the beasts and their magic powers, and even how some of them can be defeated. One of the stories almost matches what happened to us with Sumar, and I'm sure there's one about a monster turning people to stone."